We maintain a cautious outlook on the Aussie dollar for a few reasons. There is a lack of growth in consumer sector, increasing unemployment and rate cuts on the horizon. 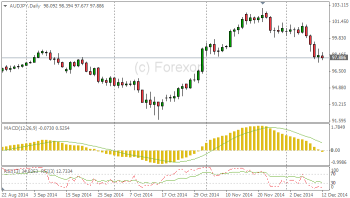 AUD/JPY is holding at 97.42. Last week the Australian Dollar suffered one of its biggest falls since 2013, the date of the last interest rate cut. The plunge in commodity prices is hurting the economy and pressure is growing on the Central Bank (RBA) to cut interest rates again. This comes on the back of a slew of data that indicates the economy is faltering more than expected. Unemployment figures released last week showed that the jobless rate has reached 6.3%, a 12 year high. National Bank Australia (NAB), along with others have downgraded growth forecasts, and are predicting two rate cuts next year. This would take the cash rate to 2 per cent. We see some short-term upside on the hourly and four-hourly time charts for day traders, but remain cautious about holding positions for longer timeframes. AUD/JPY has dropped 2.5 per cent in December. Australia is at the start of a phase rate reductions. For this reason, we see carry trading funds moving to alternatives such as the New Zealand Dollar. While AUD/JPY has fallen, NZD/JPY has climbed 10.4 per cent since October. The Kiwi Dollar offers a 100-basis point rate advantage, and now yields 3.5 per cent.